Lithium, a mood stabilizer widely used to treat bipolar disorder, also is a neuroprotectant, providing neurons protection from apoptosis induced by a broad spectrum of toxic conditions. A portion of this neuroprotection is due to lithium's inhibition of glycogen synthase kinase-3. The present investigation examined if the neuroprotection provided by lithium included apoptosis induced by stimulation of the death domain-containing receptor Fas. 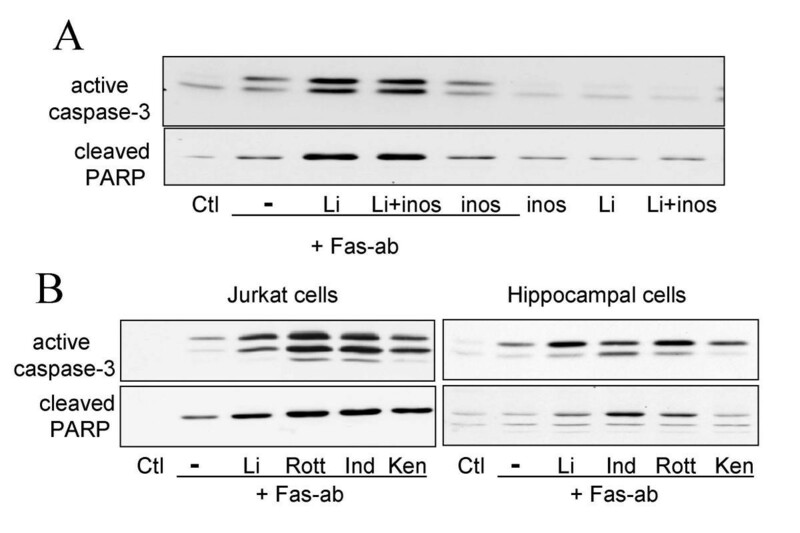 Instead of providing protection, treatment with 20 mM lithium significantly increased apoptotic signaling induced by activation of Fas, and this occurred in both Jurkat cells and differentiated immortalized hippocampal neurons. Other inhibitors of glycogen synthase kinase-3, including 20 μM indirubin-3'-monoxime, 5 μM kenpaullone, and 5 μM rottlerin, also facilitated Fas-induced apoptotic signaling, indicating that the facilitation of apoptosis by lithium was due to inhibition of glycogen synthase kinase-3. These results demonstrate that lithium is not always a neuroprotectant, and it has the opposite effect of facilitating apoptosis mediated by stimulation of death domain-containing receptors. Lithium has long been the mainstay treatment for bipolar disorder. However, its therapeutic mechanism of action remains unclear, in part because of the large number of biochemical effects attributed to lithium . Nonetheless, two actions are prime candidates as lithium's therapeutic targets, inhibition of inositol monophosphatase  and inhibition of glycogen synthase kinase-3 (GSK3) . Both enzymes are directly inhibited by lithium, but since lithium has numerous diverse effects, it is presently unknown which actions contribute to its therapeutic effects. In addition to stabilizing mood, lithium is a broadly acting cellular protectant, providing neurons and other cells protection from many insults (reviewed in [4–6]). These include, but are not limited to, growth factor withdrawal and inhibition of the phosphoinositide 3-kinase (PI3K)/Akt signaling pathway , treatment with amyloid β-peptide [8–11], DNA damage , endoplasmic reticulum stress , ischemia [14, 15], and a variety of toxic agents [5, 16, 17]. While the mechanistic basis for protection by lithium in all conditions is not known, in some instances protection is due to its inhibition of GSK3 [12, 13, 18–20]. This neuroprotective effect of lithium due to inhibition of GSK3 complements accumulating evidence that GSK3 promotes apoptosis in a large number of conditions (reviewed in ). Regardless of the mechanism, the broad neuroprotective capacity of lithium has led many investigators to suggest the possibility that the therapeutic use of lithium be expanded from mood disorders to also include neurodegenerative conditions where lithium may be able to retard neuronal dysfunction and death. Conspicuously absent from reports of lithium's protective effects are studies of neuronal apoptosis induced by activation of death domain-containing receptors, such as Fas (also called CD95) and the receptor for tumor necrosis factor-α (TNFα). These receptors contain an intracellular death domain motif that is required for stimulating apoptosis, a major function of these receptors that is initiated through activation of intracellular proteins and proceeds to caspase-3 activation . Interestingly, several years ago lithium was reported to promote the cytotoxic actions of TNFα [22–24], indicating that lithium's influence on neuronal responses to stimulation of death domain-containing receptors may differ from other conditions in which lithium affords neuroprotection. Therefore, this study examined the effects of lithium on the activation of apoptotic signaling induced by stimulation of the death domain-containing receptor Fas in two types of cells, Jurkat cells and immortalized mouse hippocampal neurons that were differentiated to a neuronal phenotype. In both cell types, 20 mM lithium significantly increased caspase-3 activation following stimulation of Fas. These results demonstrate that in contrast to many other modes of cell death, lithium is not protective following Fas activation, but conversely promotes apoptosis. Jurkat cells were used initially to test if lithium modulates apoptotic signaling induced by activation of Fas. Immunoblots of active caspase-3 and of a poly(ADP-ribose) polymerase (PARP) 85 kDa cleavage product, which is generated by caspase-3-mediated proteolysis, provided indicators of activation of apoptotic signaling. Treatment with an agonistic anti-Fas antibody (5 to 50 ng/ml) caused concentration-dependent increases in active caspase-3 (Fig. 1A) and cleaved PARP (Fig. 1B). Since the Ki of lithium's inhibitory effect on GSK3 is approximately 2 mM, a concentration of 20 mM lithium was used to achieve 80–90% inhibition as indicated by previously published concentration-response studies . Pretreatment with 20 mM lithium (30 min) potentiated Fas-induced caspase-3 activation by 5.8-fold at the lowest concentration of agonistic Fas antibody. PARP cleavage induced by stimulation of Fas also was potentiated by lithium, with the greatest potentiation evident at the lowest concentration of agonistic Fas antibody. Treatment with lithium alone caused no activation of caspase-3 or PARP cleavage. Thus, lithium treatment facilitated Fas-mediated activation of apoptotic signaling, having the greatest effects at sub-maximal concentrations of Fas antibody. Lithium promotes apoptotic signaling mediated by Fas in Jurkat cells. Jurkat cells were pretreated with 20 mM lithium for 30 min as indicated, followed by treatment with an agonistic anti-Fas antibody (5, 10, 20, or 50 ng/ml). 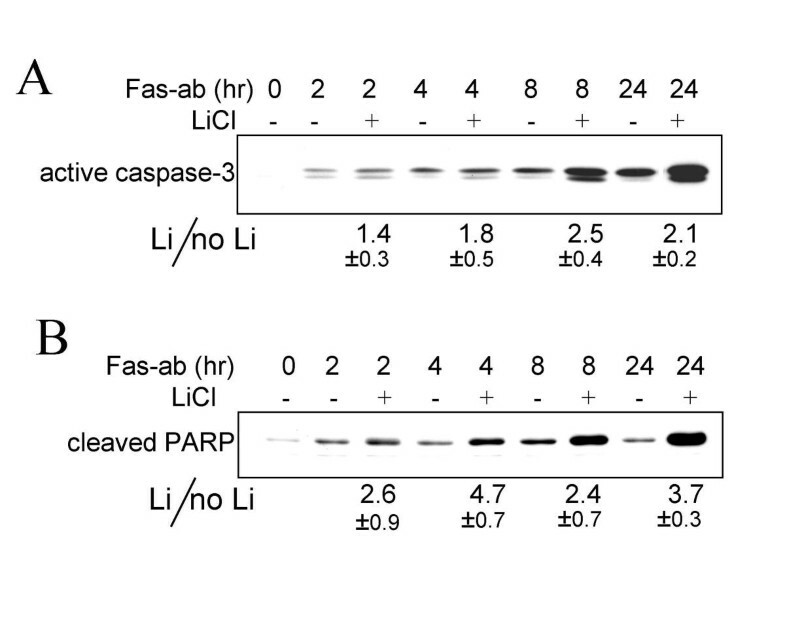 After 24 hr, immunoblots were used to detect (A) active caspase-3, and (B) cleaved PARP. 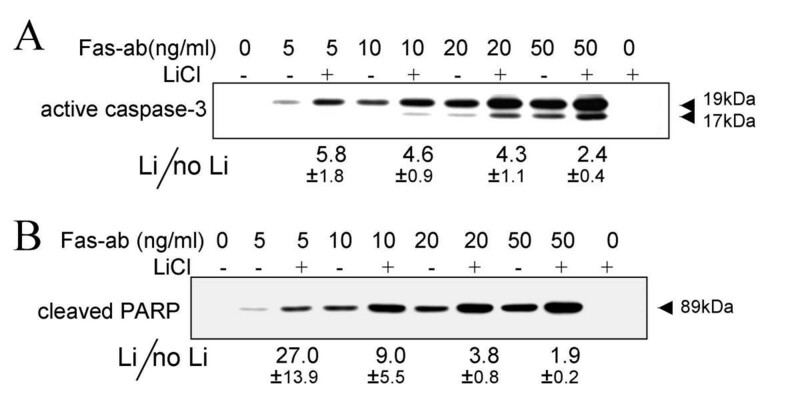 Densitometry was used to measure immunoreactive bands and the ratios of the responses in the presence and absence of lithium were calculated (shown under the immunoblots; Mean ± SEM; n = 3). Flow cytometry was used to quantitate the time-dependence of Jurkat cell death caused by Fas stimulation in the absence and presence of lithium (Fig. 2). Stimulation of Fas caused a time-dependent increase in the number of apoptotic cells, and lithium treatment approximately doubled Fas-induced apoptosis at all times measured. Thus, lithium promoted apoptosis induced by stimulation of Fas death domain-containing receptors in Jurkat cells. Lithium promotes Fas-induced apoptosis in Jurkat cells. 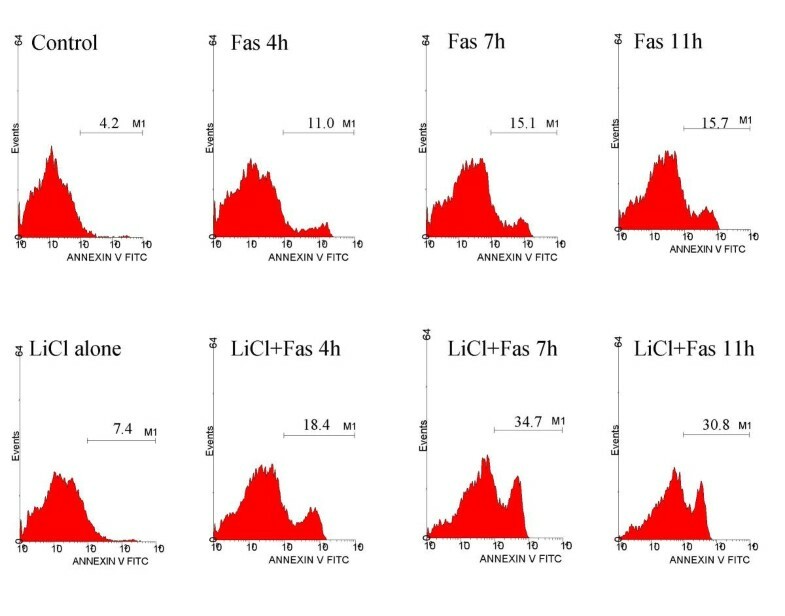 Flow cytometry with propidium iodide was used to identify apoptotic cells 4, 7, and 11 hr after treatment with anti-Fas (20 ng/ml) in the absence (top row) or presence (bottom row) of 20 mM lithium. The next goal was to identify a neuronal model system in which Fas-stimulated apoptosis could be investigated, because few cultured neuronal cell lines express the appropriate receptors and signaling activities. Preliminary experiments showed that differentiated immortalized hippocampal neurons responded to Fas stimulation with caspase-3 activation and cell death, therefore these cells were used to test if lithium modulated this response. Treatment of differentiated immortalized hippocampal neurons with an agonistic anti-Fas antibody (1 μg/ml), in the absence or presence of 20 mM lithium caused a time-dependent activation of caspase-3 (Fig. 3A) and of PARP proteolysis (Fig. 3B). Both of these apoptotic responses to stimulation of Fas were increased by treatment with 20 mM lithium (Fig. 3), whereas lithium alone had no effect on these parameters. As indicated by the values given below the western blots, lithium treatment increased Fas-induced caspase-3 activation by approximately two-fold throughout the experimental time course. Lithium promotes apoptotic signaling mediated by Fas in differentiated immortalized hippocampal neurons. Differentiated immortalized hippocampal neurons were pretreated with 20 mM lithium for 30 min as indicated, followed by treatment with an agonistic anti-Fas antibody (10 μg/ml). Immunoblots were used to measure the time-dependent (A) activation of caspase-3, and (B) PARP cleavage. Ratios of the responses in the presence and absence of lithium are shown under the immunoblots (Mean ± SEM; n = 3–5). The two predominantly studied actions of lithium are inositol depletion and inhibition of GSK3. Therefore, we examined if either of these two actions could account for lithium's facilitation of Fas-induced apoptosis. Inhibition of inositol monophosphatase by lithium could conceivably result in depletion of inositol  which might facilitate Fas-induced apoptosis. To test this, cells were pretreated with 20 mM myo-inositol to eliminate any potential inositol depletion. This treatment had no effect on Fas-induced apoptotic signaling in the presence or absence of lithium (Fig. 4A), indicating that inositol depletion did not account for the facilitation of caspase-3 activation caused by lithium. GSK3 inhibitors facilitate Fas-induced apoptosis. (A) Differentiated immortalized hippocampal neurons were pretreated for 30 min with 20 mM lithium, with or without 20 mM myo-inositol, and active caspase-3 and proteolyzed PARP were measured 24 hr with or without Fas stimulation. (B) In Jurkat cells and differentiated immortalized hippocampal neurons, activation of caspase-3 and PARP cleavage induced by Fas stimulation were facilitated following 30 min pretreatment with 20 mM lithium, 5 μM rottlerin (Rott), 20 μM indirubin-3'-monoxime (Ind), or 5 μM kenpaullone (Ken). To test if Fas-induced apoptosis was facilitated by lithium's inhibition of GSK3, additional GSK3 inhibitors were tested, including 20 μM indirubin-3'-monoxime , 5 μM kenpaullone , and 5 μM rottlerin . As with lithium, to varying degrees each of these GSK3 inhibitors also increased Fas-induced caspase-3 activation and PARP proteolysis in both Jurkat cells and differentiated hippocampal cells (Fig. 4B). These findings indicate that inhibition of GSK3 facilitates Fas-induced caspase activation. The results of this study demonstrate for the first time that lithium and other GSK3 inhibitors promote death domain-containing receptor-mediated apoptosis in neural cells, and that Fas-mediated apoptotic signaling is facilitated by lithium. Thus, in contrast to much current literature, lithium is not always neuroprotective and GSK3 is not always pro-apoptotic. Lithium facilitated apoptotic signaling induced by stimulation of Fas, and this facilitation by lithium occurred in two dissimilar types of cells, Jurkat cells and differentiated hippocampal neurons. These findings extend to Fas, and to neurons, previous reports that lithium promotes TNFα-induced cytotoxicity [22–24, 29]. Lithium and another specific inhibitor of GSK3 also recently were reported to enhance apoptosis induced by tumor necrosis factor-related apoptosis-inducing ligand (TRAIL) in human prostate cancer cell lines . Taken together, it is evident that apoptosis induced by activation of death domain-containing receptors is facilitated by lithium, as opposed to the protective action of lithium in many other conditions. For example, pretreatment with a high concentration of lithium (10 to 30 mM) previously was reported to protect cells from apoptosis and/or loss of viability caused by amyloid β-peptide [8, 11], withdrawal of nerve growth factor , DNA damage , hypoxia , trophic factor withdrawal [33, 34], hypertonic stress , potassium-withdrawal or inhibition of PI3K , endoplasmic reticulum stress , platelet activating factor , rotenone, and 1-methyl-4-phenylpyridinium (MPP) . This different effect of lithium among apoptotic conditions is likely related to the mechanisms mediating the two major classes of apoptosis: intrinsic and extrinsic apoptosis . Many, if not all, of the conditions in which lithium is protective appear to activate the intrinsic apoptotic signaling pathway. In contrast, the extrinsic apoptosis pathway is induced by activation of Fas, TRAIL, and TNFα receptors. The fundamental differences in these apoptotic mechanisms appear linked to the differential effects of lithium. The mechanism by which lithium promotes the cytotoxicity caused by stimulation of Fas appears due to inhibition of GSK3 because other GSK3 inhibitors had the same effect. This is in accordance with the conclusions that lithium's inhibition of GSK3 facilitates apoptosis induced by TRAIL  and by TNFα , and that TNFα-induced hepatotoxicity was potentiated by elimination of GSK3β or treatment with lithium . However, other investigators concluded that lithium's facilitation of TNFα-induced apoptosis was independent of GSK3 inhibition . In contrast with our findings, Schotte et al  reported that in stable lines of fibrosarcoma cells transfected with Fas there was no potentiation by lithium of agonistic anti-Fas-induced cell death. Whether this difference from our results is caused by different cell types, over-expressed Fas, or other reasons is unknown. We speculate that since we observed the greatest effects of lithium at sub-maximal activation of Fas, facilitation by lithium might be difficult to detect in cells overexpressing Fas. These results indicate that GSK3 attenuates extrinsic apoptosis, and that lithium and other GSK3 inhibitors block this effect to promote extrinsic apoptosis. As a corollary, this raises the question of whether or not such an action of lithium could occur in vivo in humans treated with therapeutic concentrations of lithium. Initially, when lithium's direct inhibition of GSK3 was described  investigators were skeptical that this could have any therapeutic relevance because the Ki for inhibition is about 2 mM, much above the therapeutic level of near 1 mM. However, lithium has the intriguing ability to inhibit GSK3 in two ways in vivo. First it causes direct inhibition. Second, this direct inhibition at a low concentration is amplified in vivo after chronic lithium treatment by an increase in the inhibitory serine-phosphorylation of GSK3 . These dual mechanisms were recently reviewed . The mechanism for this dual inhibition was recently proposed by Klein's group to be due to regulation of phosphatases acting on GSK3 . Therefore, although high lithium concentrations are necessary to cause substantial inhibition of GSK3 in acute in vitro experiments, the effects of lower lithium levels achieved in vivo after chronic administration are amplified by this mechanism. If this amplification mechanism contributes to lithium's inhibition of GSK3 in vivo, and inhibition of GSK3 occurs to a significant extent in vivo with a therapeutically relevant concentration of lithium, then the same rationale suggests that lithium also may facilitate extrinsic apoptosis in vivo dependent on the magnitude of inhibition of GSK3 that is necessary for this effect. These experiments demonstrated that lithium facilitates Fas-induced apoptotic signaling in Jurkat cells and in differentiated hippocampal neurons. Along with previous reports that lithium potentiates apoptosis induced by TNFα or TRAIL, it may be possible to generalize that lithium facilitates extrinsic apoptotic signaling by death domain-containing receptors, as opposed to its protective capacity in intrinsic apoptosis. This fundamental difference may be due to the roles of GSK3 in these signaling pathways, specifically its inhibition of NFκB which is particularly important in counteracting the extrinsic apoptotic signaling , and the promotion by GSK3 of intrinsic apoptotic signaling. This action of lithium may need to be taken into consideration when lithium is proposed for use as a neuroprotectant. For example in Alzheimer's disease, whereas lithium is protective against the actions of Aβ [8–11], there is also much evidence of inflammation  which may be exacerbated by lithium's potentiation of signaling induced by stimulation of death domain-containing receptors. Future investigations will need to examine if this occurs in the central nervous system and with therapeutic levels of lithium. Jurkat cells were grown in RPMI 1640 medium (Cellgro, Herndon, VA) supplemented with 10% fetal bovine serum, 2 mM L-glutamine, 100 U/ml penicillin and 100 μg/ml streptomycin. Immortalized hippocampal neurons  (generously provided by Dr. M. F. Mehler, Albert Einstein College of Medicine) were differentiated by incubation for 6 days at 39°C in Neurobasal media containing B-27 supplement  prior to experimental manipulations. Where indicated, cells were treated with 20 mM LiCl, 20 μM indirubin-3'-monoxime (Alexis Biochemicals, San Diego, CA), 5 μM kenpaullone (Sigma), 5 μM rottlerin (Calbiochem, La Jolla, CA), and the indicated amounts of agonistic anti-Fas antibody (anti-human Fas was from Upstate Biotech, Lake Placid, NY, and anti-mouse Fas was from Pharmingen, San Diego, CA). Cells were harvested and immunoblots were prepared as described previously  using antibodies to proteolyzed PARP 85 kDa fragment (PharMingen/Transduction Laboratories, San Diego, CA), and anti-active casapse-3 (Cell Signaling, Beverly, MA). Flow cytometry with propidium iodide was carried out as described previously . LS carried out all of the experiments. TZ and RSJ conceived, designed, and analyzed the experiments. All authors read and approved the final manuscript.